Vikas Trivedi is a group leader at the newest centre at the PRBB, EMBL-Barcelona. His group is trying to understand how cells self-organise from a physics point of view. In order to study that, they use organoids. 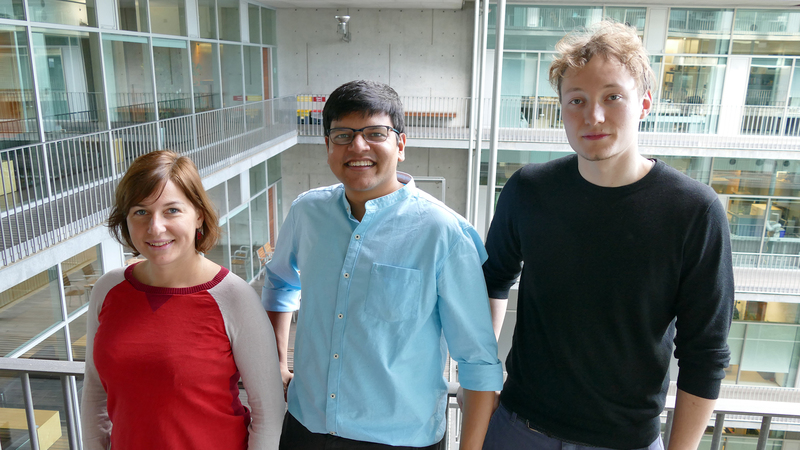 Vikas Trivedi surrounded by the two members of his yet-growing group, Krisztina Arato (research assistant), and Kerim Anlas (PhD student), who both have molecular biology and biochemistry background. 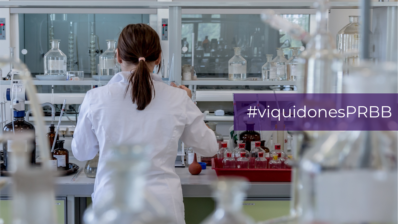 Vikas Trivedi, a group leader at the youngest site of the European Molecular Biology Laboratory (EMBL) in Barcelona, started as an engineer at the Indian Institute of Technology Kanpur. He moved to the field of bioimaging during his PhD in Scott Fraser’s lab at Caltech, Pasadena, USA. 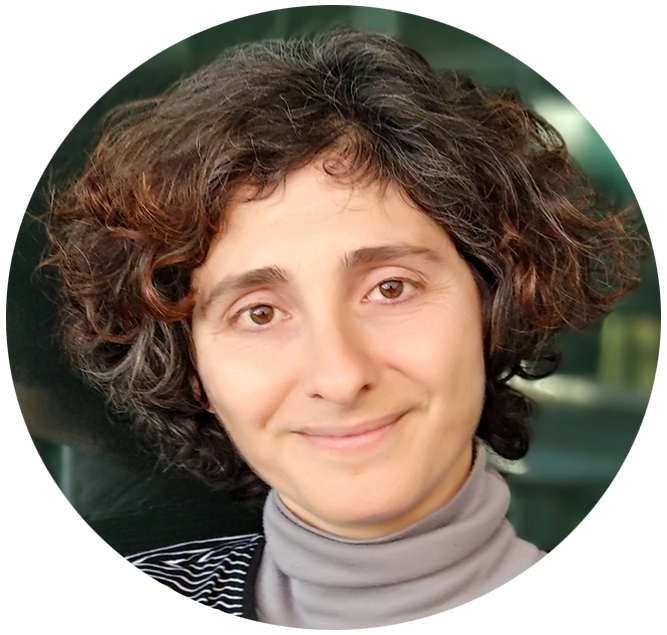 “I developed imaging and image processing tools to try to understand heart development in zebrafish. But the lab was so interdisciplinary and collaborative that I got to work on other model organisms and other problems”. 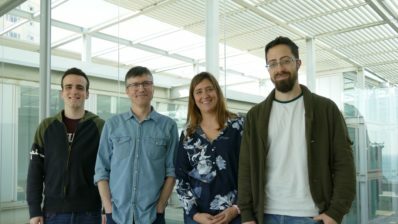 Later, he moved to Cambridge, UK, for a postdoc, and after just one and a half years, in late 2018 he joined us at the Barcelona Biomedical Research Park (PRBB) as a Group Leader at EMBL-Barcelona. Trivedi is trying to understand how cells self-organise from a physics point of view. “In an embryo there are many external factors that affect its development, for example those supplied by the mother or by extraembryonic tissues, such as the yolk. But I am interested in the inherent capability of the embryonic cells: if they are outside the embryo, can they still recapitulate that development?”, he wonders. When he arrived to the lab of Alfonso Martinez Arias in Cambridge, Trivedi was introduced to mouse gastruloids. These are a type of organoids (150-200 microns in diameter to start with) generated from several hundreds of individual mouse embryonic stem cells (ESCs) which aggregate to form a sphere. Surprisingly, this sphere eventually elongates and develops the three body axes reminiscent of the actual mouse embryo. What his lab now wants to understand is the physics behind this process. In particular, he emphasises two main questions: how do the cells break the symmetry of the initial sphere? And how do cells organise after this to develop the body axes? When mouse, or zebrafish, embryonic cells are taken out of the embryo and put together, they try to make a polarised embryo on their own. If you look at mouse and zebrafish embryos, they seem very different in terms of shape and overall geometry. However, the gastruloids and pescoids (the ‘embryonic organoids’ assembled outside of their native environment) appear similar to each other both at the very beginning of their development, when they are but a ball made of cells, as well as when they start elongating. This has made Trivedi wonder whether that which he sees happening outside the embryo is actually a ‘naked’ developmental program, which we can never observe in a real embryo because of all the other influences that exist. 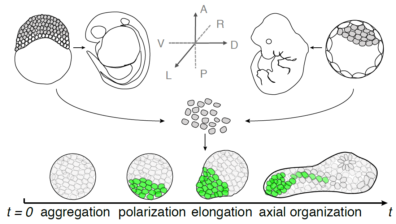 Embryonic cells, when taken out of their embryonic context and allowed to self-organise in 3D, within homogeneously distributed signals, can generate body axes in a species-independent manner. Figure from the Trivedi lab. “Our thinking is that what we are observing could be a very fundamental, default mode of development, and depending on the pressures the different species have had during evolution they could have built on this basic program” he explains. If this is correct, evolution would have used this fundamental program of development to build on different body plans in different organisms. So, Trivedi ventures, can this basic patterning process be understood well enough? Can we have cells form a mouse-like or a fish-like embryonic morphology, depending on what conditions we put them in? A mouse embryo is very small compared to a fish or chicken embryo. 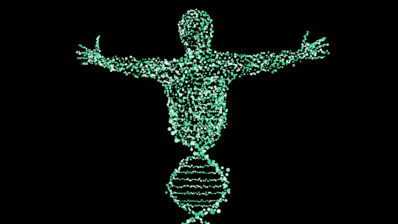 But they use the same genetic network to determine the formation of the axis. This has been known for a while. Trivedi is trying to go beyond genes and biology, into physics, looking at the mechanical factors at play during morphogenesis. Because they are generating these embryonic organoids in the lab, they can, so to speak, make them “à la carte”. For example, instead of the usual 300 cells, they can create one with 30 and one with 3,000 and see what happens, how the gene expression scales. These experiments cannot be done in an embryo. This is precisely the reason to use an artificial system; that it can be controlled, helping to understand how it is formed – and perhaps also what can go wrong. “Developmental defects are very difficult to study in vivo, because many mutants are lethal”, explains Trivedi. The artificial system he is creating holds promise to overcome this difficulty. These artificial structures that the group works with never manage to survive (the gastruloids are grown for six days, and the pescoids for about one day – fish develop faster). But that’s not a problem for Trivedi; quite the opposite. “Failure is important for us. We actually want the gastruloids and pescoids to fail in attempting to make embryos, so we can learn to rescue them, by engineering ways of making them better and understand what a real embryo is doing”. An artificial system can be controlled and studied in more depth; and if it fails to develop, we can try to understand why. In order to do all this work, and because of his own engineering background, the lab that Trivedi leads is very interdisciplinary. 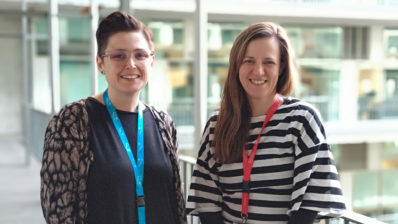 Krisztina Arato joined the group last year as senior researcher coming from another of the centres at the PRBB, the Centre for Genomic Regulation (CRG), where she did her PhD. Kerim Anlas, the youngest member, is the first PhD student in the group. They both come with very strong backgrounds in biochemistry, molecular biology and imaging. The lab also has a strong focus on building new tools and techniques; microscopes, image processing, in silico modelling and quantitative, multiplexed labelling. Because of the breadth of methodologies they use and implement, the still young group has to be very multidisciplinary, and Trivedi aims to bring in people with different backgrounds who can understand each other. “But my first priority, really, is to build a very happy group”, says Trivedi convinced. “If people are happy, many things can happen, even if they require some training. I’m talking from experience; during my PhD and postdoc I moved to fields unknown to me and I received a lot of help. I met excellent scientists and very friendly people who were generous with their time and energy to teach me and collaborate without being territorial. Having a supportive environment where people are willing to nurture a younger generation is a privilege; I have enjoyed that privilege, and I would like my lab to be such a place”, he concludes.